Vanishing Point(s) is a site-specific art installation by Michael Takeo Magruder and Dr. Hugh Denard that explores creative collisions and collaborative possibilities between contemporary art discourse and humanities research. Commissioned for Digital Humanities 2010 for the Great Hall of the Grade I listed King’s Building created in 1831 by English architect Sir Robert Smirke (1781 - 1867), the project conjoins Takeo’s long-standing use of computational processes and virtual environments as frameworks for artistic expression and Denard’s studies of the playfully illusionistic and fantastical worlds of Roman fresco art. Vanishing Point(s) takes as its inspiration the astonishingly complex and beautiful ways in which Roman architecture and painting often converged, immersing the viewer in imagined spaces – idealised cities and gardens, palaces and shrines, theatres and basilicas – and beguilingly interweaving physical architecture with painted views so that it is not always easy to discern fact from fantasy; these are indeed "virtual" worlds that speak to the digitally-generated virtual worlds of the Avatar Age. 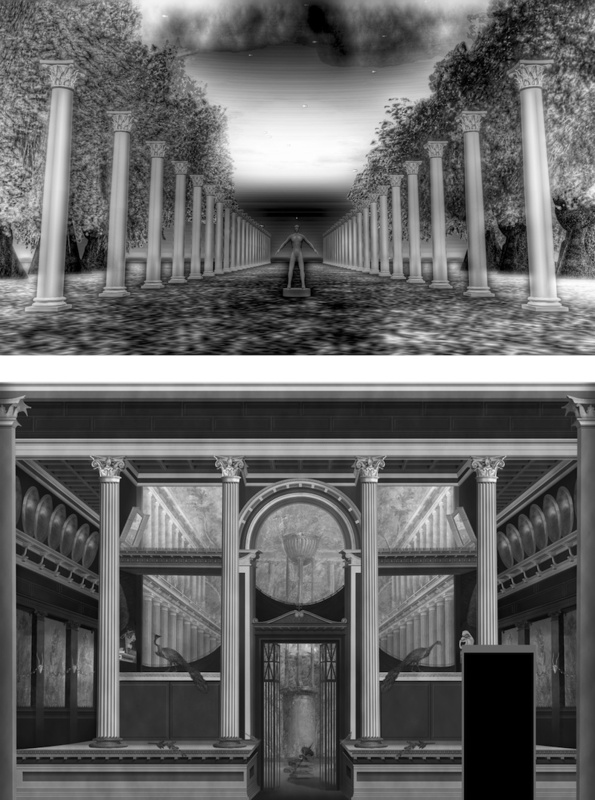 The creators have drawn deeply upon the conceptual and compositional principles of theatrically-inspired Roman frescoes to form structured vistas in the online synthetic realm of Second Life as the visual source material for a new work that evokes the spatial-pictorial tradition of medieval stained glass. Through processes of reimagining and reconstructing, Vanishing Point(s) invites ancient and medieval principles of spatial and pictorial representation to speak to this present age of data networks, mixed-realities and multimodal existence. Michael Takeo Magruder (b.1974, US/UK) BSc (University of Virginia) is an artist and researcher based in King’s Visualisation Lab, King’s College London. His creative practice extends traditional modes of artistic production through the use of emerging media including high-performance computing, mobile devices and virtual environments, blending Information Age technologies and aesthetics to explore the networked, digital world. His work has been showcased in over 200 exhibitions in 30 countries, including Manifesta 8: European Biennial of Contemporary Art, Murcia; the Courtauld Institute of Art, London; EAST International 2005, Norwich; Georges Pompidou Center, Paris; Tokyo Metropolitan Museum of Photography, Japan; and Trans-Media-Akademie, Hellerau. 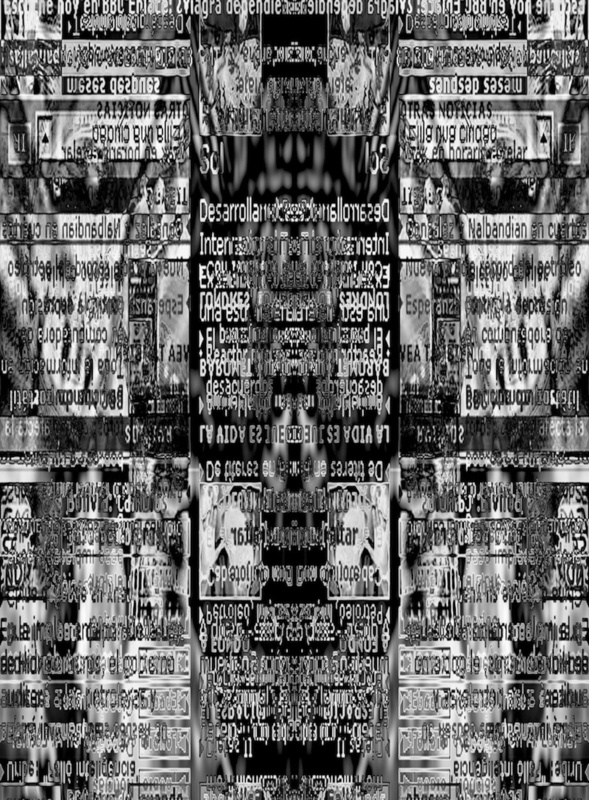 His artistic practice has been funded by the Esmée Fairbairn Foundation, the Andy Warhol Foundation for the Visual Arts, Arts Council England and The National Endowment for the Arts, USA, and he has been commissioned by numerous public galleries in the UK and abroad and by the leading Internet Art portal Turbulence.org. Dr. Hugh Denard (b.1970, IE) BA (Dublin), MA, PhD (Exeter) is Associate Director of King’s Visualisation Lab in the Centre for Computing in the Humanities, King’s College London, where he convenes the MA in Digital Culture and Technology. He is a specialist in ancient Greek, Roman and twentieth-century Irish theatre history and in the application of digital visualisation methodologies in the humanities. He proposed and edits the internationally-recognised London Charter for the Computer-based Visualisation of Cultural Heritage and has jointly directed numerous projects funded by the AHRC, Arts Council England, British Council-Italian Ministry of Research, Eduserv Foundation, JISC, Leverhulme Trust and the Metropolitan Museum of Art. In Second Life, he co-directed the Theatron 3 project, collaborates with artist Michael Takeo Magruder, curates Digital Humanities Island, and teaches postgraduate modules on applied visualisation in the arts, humanities and cultural heritage. (top) Work-in-progress study for Vanishing Point(s), 2010. (bottom) Visual reconstruction of the Villa of Olpontis, oecus Room 15, east wall fresco by Martin Blazeby, KVL, 2010. Communion is new media art installation by Michael Takeo Magruder that reflects upon aesthetic and informational qualities of language within today’s technologically-enabled and multicultural society. The artwork is created exclusively from sampled 'front-pages' of the BBC's online international news service, digitally recorded at a finite moment in time. Each of the composition's forty distinct elements correlates to a different language edition of the BBC website. The captured web-pages have been algorithmically processed through a single, predefined sequence of instructions. The resulting images are visually reminiscent of traditional stained-glass windows and Rorschach inkblots, and through such spiritual and psychological references, notions of the transcendental and mechanisms for emotional response are introduced. The visual structures are only semi-abstract and even though the media itself provides the aesthetic essence of the work, the language – and information it contains – is still partially discernible. Originally commissioned in 2005 by Arts Council England for the forty leaded-glass windows in the main gallery space of 20-21 Visual Arts Centre, North Lincolnshire, Communion will be reworked as a series of wall-mounted prints for Digital Humanities 2010. 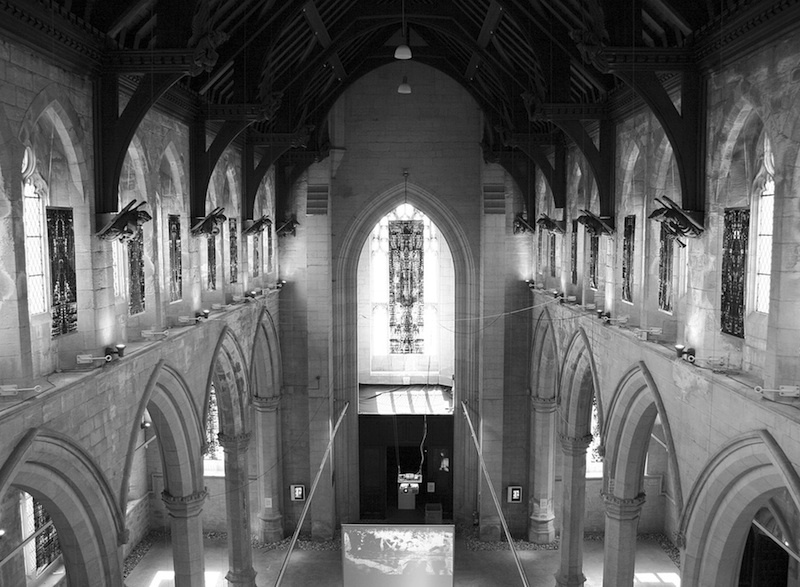 Installation view of Communion at 20-21 Visual Arts Centre, UK, 2005. Detailed view of Communion (Spanish), 2005.